Are you Olympics junkies like we are in our house? Doesn't matter if it is winter or summer, we LOVE watching the games. Everything from the opening ceremonies to the closing ceremonies and every event in between. I feel like our TV is constantly on! 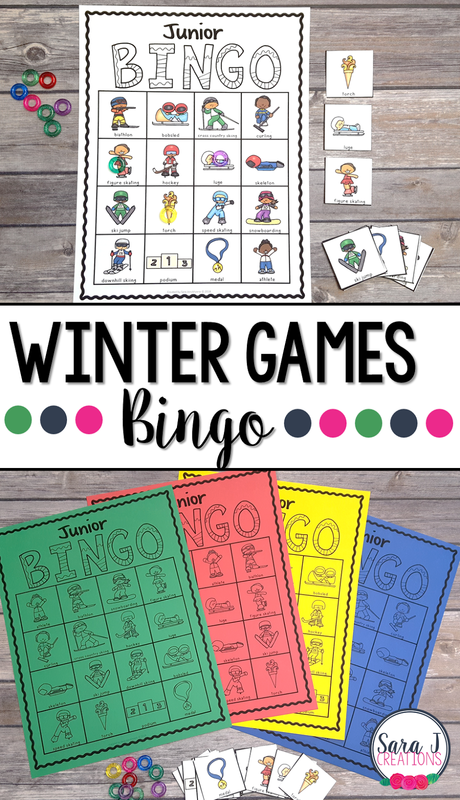 To prepare for the winter games, I created Winter Games Junior Bingo. I figured it would be a great way to introduce my girls to some of the sports that we would be watching in the coming weeks. I made this a junior version so that there are only 16 squares. I figured this would be easier for younger children to play. Underneath each winter games picture is a label. This is a great way to teach students vocabulary words. There are 30 different boards so you can just print and play. I've included color versions and black and white versions. I printed our black and white versions on colored cardstock to make it POP! There are also teacher calling cards (in color and black and white.) Just grab something to cover the squares - I love mini erasers or math manipulatives for this. Call out words and have your students cover the pictures. When they get 4 in a row (horizontal, vertical or diagonal) they call out BINGO!! You can add a fun prize for the winners or just have them clear their boards and play again. I'm so excited to play this with my girls and get them excited for watching the Olympics in a few weeks.